Twitter has launched a new real-time tools for website developers. With the New embedded timelines you can place any public timeline on your website, connecting your readers with the Tweets that you and others create on Twitter. With one line of HTML you can deliver any account’s Tweets, favorites, a list, search query or #hashtag directly to your website. Embedded timelines are interactive, enabling visitors to reply, retweet and favorite Tweets, follow your accounts, and Tweet directly to you all without leaving the page. These new tools are built specifically for the web: they load fast, scale with your traffic as your audience grows, update in real-time, and work great in modern, legacy, and mobile browsers. 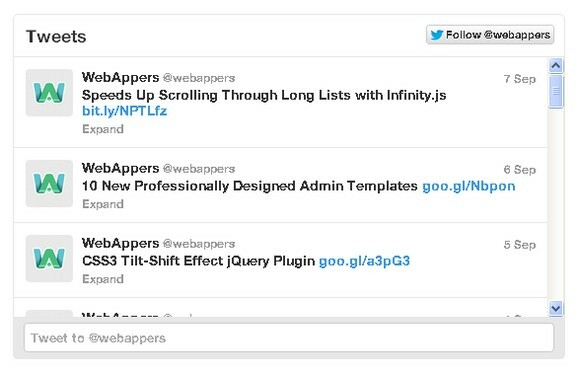 Please do not forget to follow @webappers on Twitter!